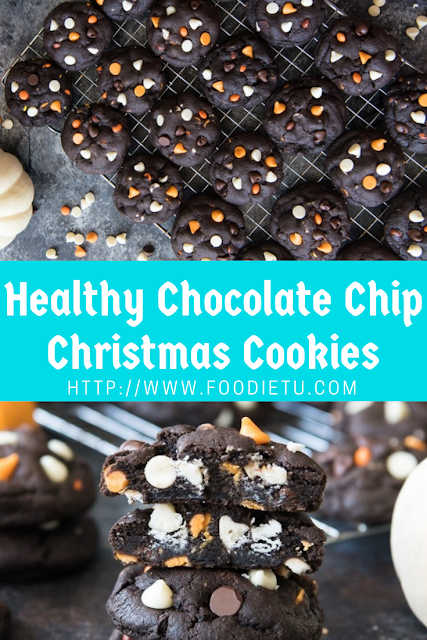 Dark Chocolate Christmas Chip Cookies have a super soft and black-as-night dark chocolate cookie base that is studded with sweet white chocolate chips and creamy peanut butter chips for a frighteningly delicious treat! These are such easy Christmas cookies to make! In a separate bowl, combine the Halloween chips, white chocolate chips, peanut butter chips, and mini Reese’s Pieces and give them a quick stir so they are evenly distributed. Gently stir or fold in 1 3/4 cups of the chips into the cookie batter, setting the remaining chips aside in reserve.